On a recent drive, we happened upon a remote mountain highway with a “Road Closed Ahead” sign. Interests piqued, we drove miles up the road where rocky cliffs seemed to appear out of nowhere and quickly close in on us. It wasn’t evident at the time, but the road was following Matilija Creek, a contributor to the Ventura River. At last we reached the closure and got out for a taste of the fresh air. It was there that we saw the small but fast-moving Matilija Creek. A few pictures and we were back in the car, rejuvenated and relaxed, retracing our path back to civilization. It was a memorable adventure and I’m happy to share the Matilija Creek cowl that came of that trip. Knit in the round, the Matilija Creek cowl begins with a ribbed edge, transitions to a charted two-color stranded knitting body, then back to a ribbed edge. 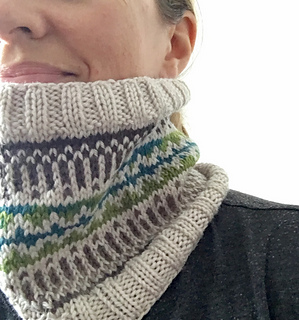 This cowl fits comfortably close to the neck so choose yarn you know to be soft on the skin. Row gauge determines the height of the cowl. Contrast colors for the sample were cut out of a single ball of Liberty Wool. You may achieve this same effect by searching through a ball of long-color changing yarn for desired colors. Alternatively, you may use three solid color yarns or use both ends of a color-changing ball.